AVI to MP4 video converter for macOS Sierra is at high chance of being used to solve video format compatibility issues to play AVI on macOS High Sierra without error, or to edit AVI on FCP, or for wide compatibility, whatever. Out of numerous AVI video converter applications for macOS High Sierra, some spoil the quality, some dawdle over AVI to MP4 conversion process. Based on tech site review, we select out a top-trending video converter for macOS High Sierra to free download, which can convert AVI to MP4 on macOS Sierra with no quality loss speedily. Which One Transcodes AVI to MP4 with Best Quality? Titled as the highest quality video converter for macOS in various sites, MacX Video Converter Pro outputs nearly original video image quality after the AVI to MP4 conversion on macOS High Sierra for its High Quality Engine. High quality output is not the only appealing feature delivered by the AVI to MP4 converting software for macOS High Sierra based MacBook Pro/Air/iMac etc. The conversion speed is quite amazing - it converts 720p 1080p 4K 8K AVI video file to MP4 on macOS High Sierra with 16× real time faster speed. In other words, that's 5× faster than common AVI to MP4 converter freeware for macOS Seirra like Handbrake, thanks to its Intel Quick Sync Video hardware acceleration support. Well-designed UI makes it very easy to convert AVI to MP4 on macOS even for novice users. Guide on how to use AVI to MP4 video converter for macOS is provided below. Step 1: Free download best video to MP4 converter on macOS and run it. Load AVI file by hitting "Add File" icon on the left. 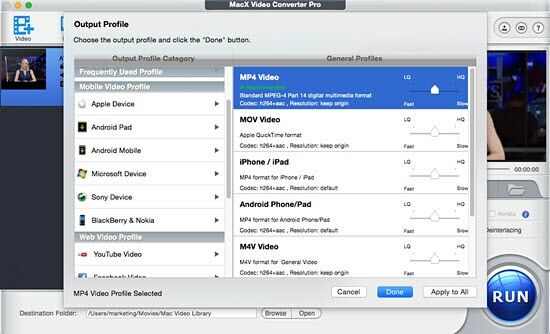 Step 2: After the AVI file is loaded, head to "Mac General Video" > "MP4 Video (H.264)" to free convert AVI to MP4 on Mac. You can drag the menu LQ (Low Quality) and HQ (High Quality) to adjust video quality simply. Tips: Here the AVI to MP4 converting software for macOS Sierra can convert AVI to MP4 video with H.264 AAC codec and MPEG4 AAC codec. H.264 vs MPEG4, H.264 is recommended. Step 3 (optional): Click "Browse" button to select a folder to save AVI to MP4 converted file on macOS Sierra. Step 4: Click "RUN" button to start to convert AVI to MP4 on macOS Sierra. It's quite the same to use the macOS Sierra AVI to MP4 converter to convert AVI to QuickTime MOV, AVI to DVD, or AVI to MP3, WMV, MKV, MP4 to AVI and more. The AVI to MP4 video converter for macOS Sierra offers many other useful features. After the AVI to MP4 converting is done, you can adjust AVI video file settings, like video codec, frame rate, aspect ratio, bit rate, audio codec, resolution etc. and compress AVI video file without losing quality if the AVI file size is large. 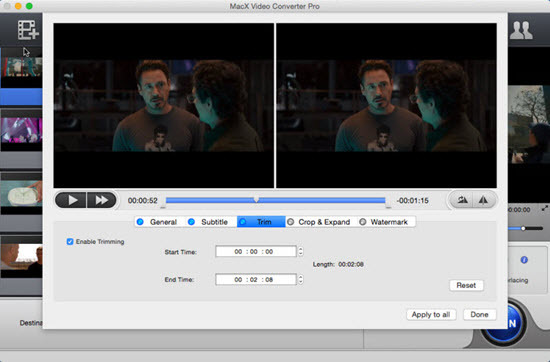 The AVI to MP4 transcoder software for macOS Sierra also gives basic video editing: split AVI files, add subtitle to AVI on macOS Sierra, add watermark to customize the video, trim video, crop & expand to remove video black bar. The AVI to MP4 converter for macOS Sierra free download on this page is 100% clean. Or you can jump to the best video converter for Mac official site to download for free. Some online AVI to MP4 video transcoders work fine if not great in AVI to MP4 video conversion. Convertio.co is one of them, allowing you to convert AVI to MP4 on macOS Sierra by simply dragging and dropping videos. It saves converted files to Google Drive or Dropbox, which may be, however, not what you want. The online video converter freeware requires no download. Users are asked to sign up and login with Google or FaceBook account. 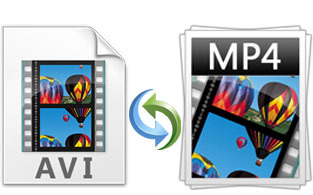 It helps convert MP4 to AVI on Mac, FLV to AVI, MKV to MP4, MP4 to MP3, MP4 to AVI and more. The free AVI to MP4 converter for macOS Sierra may delay the video conversion progress. File size limit and efficiency are the biggest drawbacks. It is an open source video editing program that can be used as video to MP4 converter for macOS Sierra. The free video converter for Mac supports common video formats as input and output. Input formats: AVI, WMV, FLV, MKV, MPEG, TS, MP4, OGM, MOV, 3GP, VOB. Output formats: MP4, TS, AVI, FLV, MKV, VOB. So, basic AVI to MP4 conversion on macOS Sierra can be achieved by the free macOS Sierra AVI to MP4 video converter. The application can clip video selections, cut, filter, but the video conversion progress may be a bit confusing at the beginning for starters.